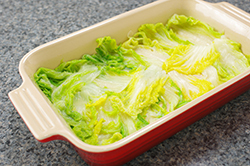 Fill a large pot – one in which you can submerse a whole head of cabbage – with water and bring to a boil. 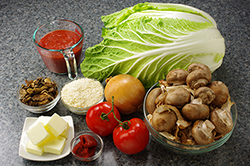 (It is helpful to use a pot with a strainer insert, such as a pasta pot, so you can pick up the insert to remove the cooked cabbage, rather than struggle with spoons or tongs.) Add the first head of cabbage and parboil for about 10 minutes. Remove and let it drain in a colander in the sink until just cool enough to handle. Meanwhile, cook the second head of cabbage, drain, and cool. 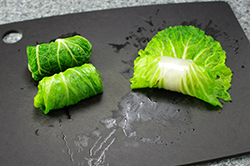 Gently pull the outer leaves off each cabbage. (Some of these might be soggy or torn.) Set these aside to line the baking dish. It helps to cut off some of the coarse stem at the beginning and while peeling off the leaves. 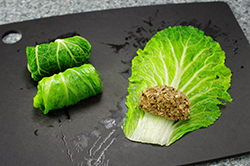 Your goal is to have 12 to 16 perfect medium to large leaves in which to roll the stuffing. 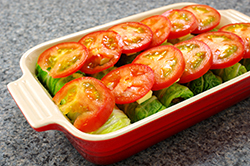 Set aside the small leaves for lining the baking dish as well. If you can get more than 16 leaves to stuff, do so – you can never have too many little doves. 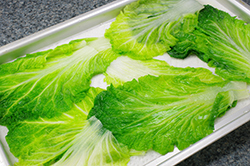 Pat each leaf dry and set aside on a kitchen or paper towel. Soak the dried mushrooms in the boiling water for at least 30 minutes, until softened. Strain the soaking liquid through a fine-mesh strainer lined with a paper towel or cheesecloth, placed over a bowl. Set the liquid aside. Squeeze the mushrooms until the juices are all extracted. 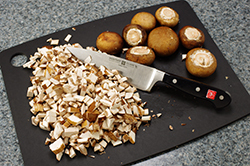 Rinse the mushrooms with cold water, pat dry, and coarsely chop. 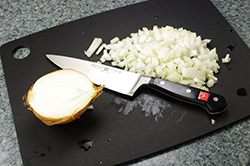 Melt 2 tbsp of the butter in a large frying pan over medium heat, and cook the onion until translucent. 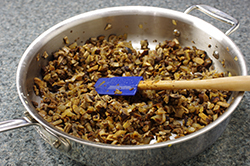 Add the chopped fresh and dried mushrooms and continue to cook until all the mushrooms are soft and golden, 5 to 10 minutes, stirring often. 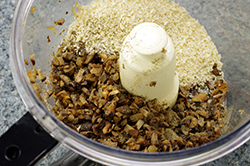 Pour the cooked mushroom mixture into a food processor and add the bread crumbs, a large pinch of salt, and a few grinds of pepper and process until well chopped and integrated, but not mushy. 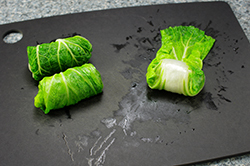 Lay out the “choice” cabbage leaves on a work surface and divide the filling among the leaves: The exact portion size for each one will depend on the size of the leaf. 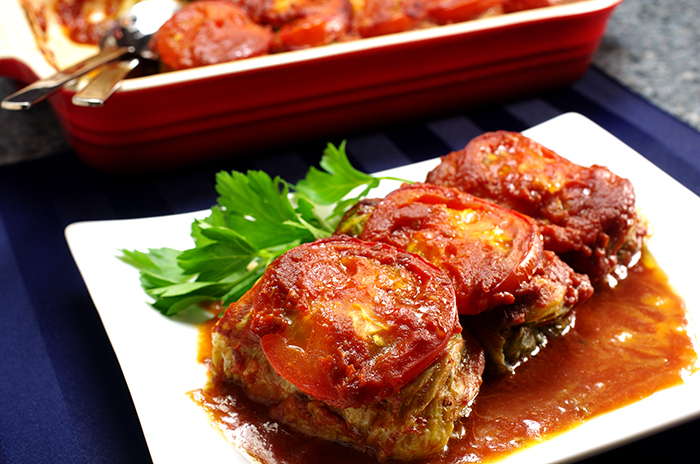 (I dollop the filling on with a tablespoon, placing it near the bottom of the leaf). If any stem remaining on the leaf seems especially tough or thick, you can pare it down with a vegetable peeler. Roll the leaves up, folding in the sides and ends so the stuffing is enclosed. 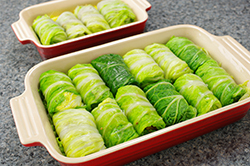 Line the bottom of a 9-x-12-in/23-x-30.5-cm baking dish with any leftover cabbage leaves. (If, after lining the dish, you find you still have a lot of leftover leaves, store them in the refrigerator and eventually chop them, cook in butter and season with salt and pepper to serve as a side dish for another meal!). Rest the rolls on top, seam-side down; they can be crowded together, just so long as they don’t overlap. 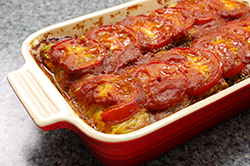 If you run out of room in one baking dish, start a smaller second one, lining it the same way. 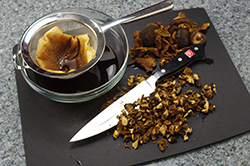 In a small saucepan, bring the reserved mushroom soaking liquid to a low boil. Whisk in the tomato paste and, when incorporated, the crushed tomatoes. Allow to boil for a minute or two, until slightly reduced and thickened. 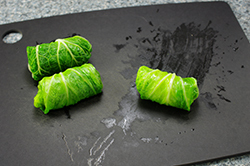 Pour over and around the cabbage rolls. The tomato broth should just come up the sides of the rolls, but not submerge them. If there is not enough broth, top off with a little chicken broth or even dry white wine. 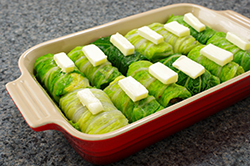 Dot the cabbage rolls with 3 tbsp of the butter and layer the tomato rounds over the top. Bake for 40 minutes to 1 hour, or until the tops are golden and slightly crispy. 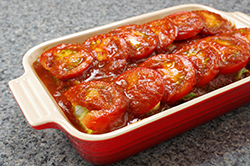 Remove the rolls to a warm platter, with the cooked tomato slices still on top. Pour the broth into a small saucepan, bring to a boil, and whisk in the remaining 2 tbsp butter. 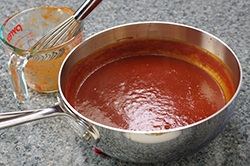 Reduce until the broth is slightly thickened and silky, and adjust the seasoning. Pour the sauce over the rolls and serve immediately. Because these “little doves” do not have rice in them, they can be served along with a side of cooked rice for a more hearty meal.